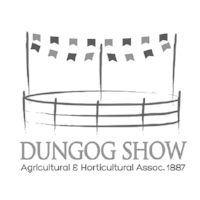 Now in its 125th year, the Dungog Show is one of Australia’s oldest country shows. Whether you come for the agriculture, the pavilion and cattle displays or the thrill of the post splitting competitions, there’s something for everyone. All competitors and exhibitors are invited to participate in the Grand Parade. To encourage participation, ticket for a lucky prize will be issued to each exhibitor as they enter the ring for the parade. I would like to take this opportunity to thank all competitors, sponsors and workers for their efforts in making the Dungog Show successful. Ongoing support and sponsorship is vital to the survival of the show. Your local show is run by local volunteers, if you can help as a ring steward assisting the judge, by handing out ribbons and recording results or in any other way we would love to hear from you.